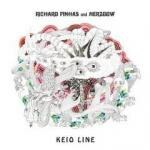 Pinhas and Merzbow title their first studio collaboration after the railway that took them from Tokyo to their studio in the suburbs, and Keio Line ends up becoming an album about traveling, like it or not. The Keio Line is an electric railway that runs from Tokyo's city section to its western suburbs. There resides the Peace Music Studio, where French avant-garde guitarist Richard Pinhas and Japanese noisemaker Masami Akita (Merzbow) undertook their very first studio collaboration. The musicians rode on the line several times together, traveling between the suburbs and the buzzing centralized hub of Tokyo's Shinjuku station. They recorded their material over two days in October of 2007; Pinhas then brought the tapes back with him to his studio in Paris and mixed the proceedings with a little help from his friends. He called the experience “magic” when he documented it months later, a piece of music and a recording process existing “in a dreamland space between Tokyo and Paris” that clearly won him over. As it happens, the Keio Line in Tokyo provides a convenient metaphor by which to interpret the album that shares its namesake. Keio Line is L-O-N-G long -- 110 minutes of ambience spanning two discs -- and the lack of dynamism in the music makes the ride feel even longer. Its spiritual proximity to travel somewhat exonerates it from requiring a narrative structure, which is good, because it doesn't have one. The musicians simply played their material live ("at the extremities of our living forces and pulsations," reflected Pinhas), perhaps improvising in accordance with the electricity that shot through them and what each of them felt was happening to the other. There's certainly an audible give-and-take here, as the music oscillates between Pinhas's howling electric guitar and Merzbow's suctioning, crumbling sounds over extended stretches of time. It's like staring out of a train window, watching the scenery transform from one type to another at several points, in noticeable but inconsequential ways. Granted, Cuneiform seems to be marketing Keio Line as a 'sensations' album that could care less about form and narrative. The packaging proclaims that the sounds it houses are "violent, soothing, noisy [and] hypnotic", a set of polarities that the musicians probably felt during recording and which they hoped to call forth in us. But the peaks just aren’t high enough and the valleys not low enough for a suite of this magnitude, so the music floats in a strange liminal space between two given poles without ever reaching any one of them. This is where the artists' pedigrees and proclivities become an issue. They’re titanic figures in their respective scenes who have tried to stay contemporary as their careers pass the 30-year mark: Pinhas just finished collaborating with über-hip Wolf Eyes, and Merzbow continues to produce records almost as fast as his labels can release them. But the guitars sound as pointedly dated as the "art-rock" term Pinhas's band Heldon exemplified in the '70s, and Merzbow's vacuum-cleaner-at-the-end-of-the-world noise is no longer fresh after so many albums of it. The players' dullish inputs and the music's sense of in-betweenness create an aggregate effect that's both boring and surreal, like a transatlantic plane flight where the surroundings are overly familiar but you don't really know where you are. I can't be sure whether the musicians simply place more value on this particular experience than I do, or whether they felt something transcendently special aboard the Keio Line that I've largely been denied while commuting on the Metro-North. In either case, Pinhas and Merzbow probably got more out of their collaboration than we may get out of listening to it, and if the musicians really did reach a higher level during those fateful trips in 2007, the record's sheer length and relative uniformity squelches that message before it can come through to our end. Travel has inspired a lot of wonderful music (Chessie, for example, has built an entire career around the goal of making railroads sound cerebral and meditative), but Keio Line doesn't do much beyond revealing its most mundane incarnation, reinforcing the fact that when it comes to compulsory traveling, most of us would gladly skip the journey and shoot right to the destination.